Goa is a very popular coastal state very close to Maharashtra. It’s barely 600 KM from Mumbai (10 hours), 450 KM from Pune (8 hours) and around 560 KM from Bengaluru (9 hours).Close proximity to these cities result in Goa being the favorite hangout all year long and that is precisely why everyone should spend A Weekend in Goa at least once . The roads are in excellent conditions for all three routes and State transport and Private buses operate daily on these routes and in plenty. Goa has it all, from beaches to nightclubs to waterfall to forest sanctuaries. The taxes levied are very less compared to other states and this results in cheap petrol and cheap booze. One can get a pint of beer for as less as INR 25 from a shop and a liter of petrol costs almost INR 5-10 less than other states. Isn’t this the best reason to spend A Weekend in Goa ? The low rates and a good standard of living attract foreigners from all over the globe. Some even come and settle here owing to its no extradition policy for foreigners. The high influx of foreigners through the past decades has put Goa on the Hippie trail and it has become a “Hippie’s Paradise”. The majority of the foreigners, who have settled here, are off to Old Manali in the summer months and return back to Goa during the winter months. This is the reason why many of the shacks are shut during the summer time (March – May). 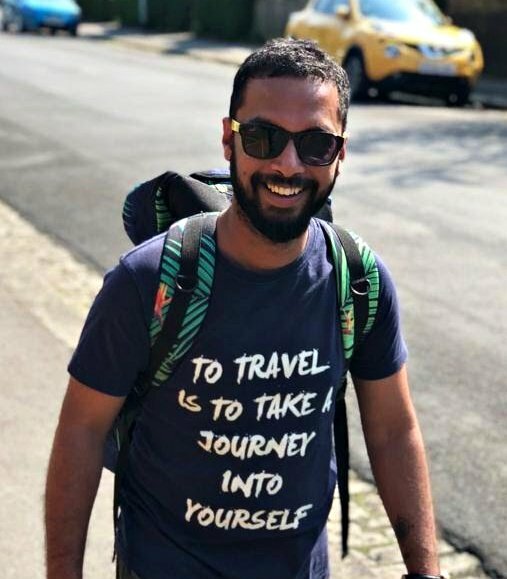 While I was studying in Pune, I experienced Goa during different months and each time with a different set of companions, from a family outing to a friend’s get-together to a couple weekend, I have done it all. And I have realized that it’s the perfect budget destination for all type of budgets ranging from INR 3k per person for a 3D/2N weekend to as high as INR 30-40k per person. Having stayed both, in a 5 star resort (Club Mahindra, Varca) and a hotel in Calangute (CalanguteResidency) and having traveled both in own car and by public transport, here are some of my tips which can help you plan your Weekend in Goa, and to enjoy Goa at any point of time in a budget of your choice. I’ll divide it into 3 categories: Accommodation, transport, and food. In the recent 4-5 years, the ease of booking a hotel has improved drastically and so have a number of hostels come up. A lot of hostels such as Zostel, Wanderer’s hostel, Roadhouse hostel, Wonderland hostel are operating in North Goa. One can stay for the night for as less as INR 300 per night. In this era of an aggressive travel industry, companies like OYO rooms, Fab hotels offer a good budgeted room with all amenities for as less as INR 1000 per night or even lesser if booked well in advance and with some promo codes. PS : A hotel near the beach may not always be the cheapest option, rather book it anywhere in the radius of 500m from the beach , this way you will be away from the crowd. AC Sleeper and Semi Sleeper buses ply daily from Mumbai, Pune and Bengaluru and one can get a seat in the bus for anything between INR 600-1500 per person, depending on the company and when you book the ticket. These rates usually shoot up during the peak tourist season of December – February. Train is also an option, but it is advisable only when you are travelling in a group, as the time taken is more than the bus and the rates are somewhat similar. Driving down is usually the most sought after option and economical too if travelling in a group. However, a better environmentally friendly alternative is to take a bus till Goa and then further rent a Car or a Bike/Scooter for the duration of the stay with rates ranging from INR 200-500 for a 2 wheeler/day and around INR 1000-1500 for a 4 wheeler/day. The roads are in excellent condition and the petrol is very economical making your Weekend in Goa a very budget friendly one. Both food and drinks are very cheap in Goa as the demand is much less than the surplus supply. There is a shack around every corner in Goa. To be on the economical side, it is better to have a tummy filling Indian meal at any of the Indian restaurants for as less as INR 150 per head and then head to the beach shack to relax. All the major fast food chains like KFC, McDonalds, and Dominoes are present in Goa, but the feeling of having food in a Goan shack/restaurant is something different altogether. It’s advisable to buy your booze from shops as the rates in the shacks are almost double for beer. A pint of Kings Beer (Goa exclusive) costs INR 25 in the shop and around INR 50 in any shack. It is very common to find everyone walking on the streets in Goa with a pint of beer in hand. The path to relaxation ! Everyone should make it a point to try some of the Goan specialty dishes such as Pork Vindaloo, Chicken Xacuti, Chicken Cafreal, Goan Fish and Prawn Curries, at least once during their stay. Everyone must try the local Goan drink, i.e. Cashew or Coconut Fenni. The taste is very unique and extremely strong, but still worth a try. Goan cashew nuts are very famous and one can get a variety in any of the Govt approved traders, with rates as low as INR 150-200 for 500 gm Cashew Nuts. You might also want to take a trip to the Spice Gardens in Goa, and these 10 reasons will surely convince you to take a trip to the Spice Gardens. Goa is a Wraveler’s hotspot and a backpacker’s paradise, hence spending a Weekend in Goa is a must . One should try to spend minimum amount on the accommodation and Transport and enjoy the typical Goan experiences, because it’s the memories that remain forever. Related : 15 Photos that will tempt you for Goa ! Already been to Goa? Share your experience in the comments. Like the Post ! Pin It for future reference. I drove from Kochi to Goa (well, I say I drove but I just sat in the front passenger seat and slept!) for a week and it was such an enjoyable drive, and subsequently an enjoyable stay. By that point I’d already been in India for 3 months so was fully aware of how cheap everything is compared to Western prices, but was expecting Goa to be a lot more expensive than I’d grown accustomed to. It surprised me, though! It was still SO cheap and affordable for everyone. We stayed in a couple different OYO rooms, ate on the beach every night and in little shacks and restaurants away from the beach for lunch, the guys bought a bunch of alcohol every night, and we visited so many different places, yet still managed to spend less than 50k INR between us (7 of us) for the whole trip. Pingback: Did you know that Puducherry is the scuba diving paradise of India? Great guide! Goa is somewhere I hear so much about but haven’t had the chance to visit yet but it’s on my list. The beaches look incredible and I like the idea that it’s so cheap! Goa is at the top of my list to visit in India. It really has a wide range of activities to enjoy and I would love spending time at Goa’s gorgeous beaches. Thanks for all your tips. A good set of tips for a budget traveller to Goa. I end up going to Goa at least once every year and like you I have spent from as little as Rs 4000 – Rs 25000. I love the chill of all the shacks in Goa. I want pancakes now. India seems to have so many cool and wonderful things to see. I notice you talk about a sleeper bus, I’m so curious about those. Do they have seats like airplanes that recline? We always travel with the kids and I think that would be an interesting experience for them. The sleeper bus I mention, are like flat beds, where you can actually sleep. Not the reclining sorts. Thanks for sharing this, it’s brought back so many memories of my stay in Goa! I was in a beach hut on Palolem beach, such a great spot. You’re so right about going only 500m away drastically changing the price. I’ve been to Goa while traveling in India a couple of years ago. it wasn’t the touristic season so it was quite empty and I met a lot of local people, it was super interesting. Although the beaches were less nice..
You should definitely go to Goa, for the chilled out atmosphere and dirt cheap alcohol.